How long will it take to fill-out the job application? Just 2 to 10 minutes (will take longer if you decide to attach a resume, cover letter, share a story and key in a couple paragraphs about your experience as a caregiver). How does Caregiverlist’s Job Application connect potential Caregiver applicants with jobs? Senior Home Care Agencies, Assisted Living Communities and Nursing Homes subscribe to Caregiverlist’s interactive job application service. As hiring needs are on-going (seniors may be suddenly discharged from the hospital or a rehabilitation facility, suddenly go onto hospice services or need more care hours for home care service) the hiring companies can easily sort, screen, contact and revisit job applications to match their hiring needs for current and future openings. It is very common for senior care companies to have multiple new openings occur each day. Caregiverlist assists them to continue to be able to meet their staffing needs by offering them interactive tools to access job applicants seeking work in their service area. How soon will I be contacted for a job interview? You could be contacted as soon as the same day you submitted the application. Many hiring senior care agencies contact applicants they are interested in possibly hiring as soon as the application arrives. Other hiring senior care agencies will contact applicants only on certain days of the week. You are welcome to submit an application again after 30 days. How will you know the geographic area where I am willing to work? The Job Application provides a drop-down box for you to indicate the mile radius you are willing to work from your home address. Can I submit another application if I have not been contacted? You may reapply after 30 days. We know that sometimes Caregivers take a job position and their client’s condition improves or their client passes away and their schedule availability will change – you are welcome to submit another application to Caregiverlist after 30 days. How can I increase my chances of being contacted for an interview and hired? Submit your Job Application and include information on your caregiving experiences – be willing to share some details about why you enjoy working as a caregiver. The job application provides an open box for you to key in this information. Attaching a resume and cover letter will show professionalism. You may also Share Your Story about a client or family member you have cared for on Caregiverlist and this will be connected to your application. Offer full availability for your work schedule. Senior Home Care Agencies and senior care communities need weekend caregiver and nursing aide staff, as well as weekday and overnight staff and part-time staff to work as substitutes. Usually companies can eventually meet any special scheduling needs. However, the more flexible your schedule, the better your chances of matching an open caregiving staffing need, which will increase your chances of being hired. You must be at least 18 years of age. Some companies do have a higher age minimum requirement for Caregivers, depending on the state where they are located. How can I become a Certified Nursing Aide? 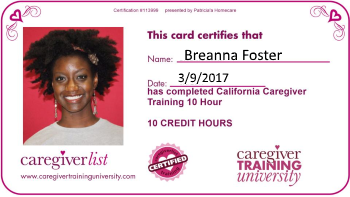 Visit Caregiverlist’s Caregiving Jobs Career Center to learn about nursing aide certification. Visit Caregiverlist’s Caregiving Jobs Career Center to learn about training. What details do Background Checks cover? Visit Caregiverlist’s Caregiving Jobs Career Center to learn about Background Checks. What Questions will the Senior Home Care Agency Application Ask? Review our Job Application Checklist of documents you will need to bring to your interview for employment eligibility verification and application processing and view a Sample Senior Home Care Agency Job Application. What special testing or information will be required? Background Checks are required and may include any or all of the following: Social Security verification, Department of Motor Vehicles record, Worker’s Compensation Information, Credit History and Criminal History. Learn more about Background Checks. What Employee Benefits are offered? As a caregiver applicant, you may be eligible for the following benefits upon hire with a Home Care Agency. This list is not guaranteed to be offered by all agencies nor is it all-inclusive. Ask the agency about their specific benefits when you interview (be sure to ask about how long you must be an actively staffed employee in order for a benefit to go into effect, as some benefits such as retirement plans may require 1 year of employment before you can participate). Visit Caregiverlist’s Caregiving Jobs Career Center to learn about benefits. What Benefits are Required by Law? All Senior Home Care Agencies, as employers in the United States, must provide contributions to Social Security, Unemployment Insurance and Worker’s Compensation Insurance. This means when you retire you will be able to collect a Social Security benefit check, as both you and your employer have contributed. Unemployment Insurance will allow you to collect an unemployment insurance benefit if you become unemployed due to no fault of your own and Worker’s Compensation Insurance will provide a benefit to you if you suffer an injury while working. Learn more about Caregiverlist’s Quality Standards for participating Senior Home Care Agencies. How much money do Caregivers earn? Caregiver pay varies by regions of the country but will typically pay a couple dollars more than minimum wage (minimum wage varies by state, click here to find the minimum wage in your state). Hourly rates typically start between $8.00 and $10.00 per hour. Daily rates typically start between $90 and $120.00 per day. Remember that when working for an agency you may qualify for overtime pay if you go over a 40-hour work week for hourly care. You will also qualify for other employee benefits. What are the minimum hours required to work for a Senior Home Care Agency? As agencies must be able to staff new clients quickly and be able to meet staffing needs required for sudden changes in medical conditions, they hire both full-time and part-time Caregivers and live-in Caregivers. Agencies will often accommodate unique schedules for high-quality Caregivers. This makes Caregiving an option for individuals who may be going to school part-time or full-time, especially if they are pursuing an education in a related field, such as Social Work or Nursing. Are you ready to be a Caregiver? Please fill-out our online Job Application to apply for a position in your area. Apply for a Caregiving Job in your area.